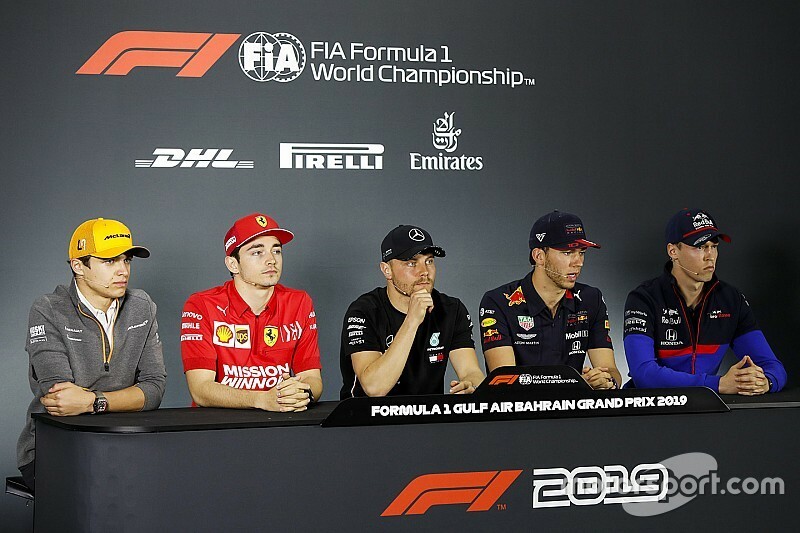 DRIVERS – Valtteri BOTTAS (Mercedes) Charles LECLERC (Ferrari), Pierre GASLY (Red Bull Racing), Daniil KVYAT (Toro Rosso), Lando NORRIS (McLaren). Lando if we could start with you please: two weeks on, how do you reflect on your grand prix debut in Melbourne? Lando NORRIS: If I look back now on how the whole weekend went, it was better than I anticipated going into the whole. During it you obviously change how you think you can do and after qualifying eighth, which was awesome for my first quali, I ended up 12th in the race, which was a bit disappointing. But overall I don’t think there were many things I did wrong. Obviously there was a the start and a couple of bits in the middle of the race, but for my first weekend I don’t think I could have asked for much more. Q: The car seemed more competitive over one lap in qualifying than it was in race conditions. Do you think that will play out this weekend as well? Is it a characteristic of the car? LN: I don’t think so much. I don’t think out race pace overall, apart from the very end of the race, was too bad. I lost a couple of positions in Turn 1, so I was still P10 and I think my pace in the first stint on the softs was reasonably good, keeping up with the guys ahead. But I just got a bit unfortunate in the middle; I didn’t get past Antonio as quickly as the others did and that put me back in terms of results. I don’t think our pace was a problem. I don’t think it’s a lot worse than our quali pace, it’s just it didn’t go as cleanly as qualifying. Q: And looking back to 12 months ago in Bahrain : a great victory for you in F2, a great weekend. What’s the goal this time around? LN: Well, I’d love to do the same, but I don’t think that is a very realistic goal! Obviously it started the season off very well last year. As much as I would love to have a similar result to what I had last year I know that’s an unrealistic aim for this weekend. I think we have got to just take it one step at a time. First time in Formula 1 here, so it’s going to be a bit different. But hopefully we can have a weekend like we did in Australia, a good qualifying and that will set us up a bit better for the race and I can work on the things I didn’t get done so well. Q: Good luck for this weekend. Thank you Lando. Daniil, you scored a point on your Formula 1 return in Australia. How satisfying was that? Daniil KVYAT: I think it was a good race for us. All the weekend we were quite competitive. It was good to know that we are in the mix. The midfield is very tight this year, so we were definitely in the fighting mix. The race itself was very…. There was quite a lot of action, so in the end to score the point at the end of the first race of the season is always good and we just look ahead. Here it’s a different kind of circuit so we’ll see what we can achieve here now. Q: Tell us a little bit more about the car. How competitive is it and what are its greatest strengths? DK: It’s hard to say just one strength or weakness. Everyone seems to be very close in the midfield, so you have to have a really good weekend always. It seems like if you lose just a couple of tenths you can lose a few positions, so you always need to be working on putting everything together. Otherwise instead of entering into Q3 you can end up maybe P14, P15. It’s a tight midfield and it’s good to know that it is. It seems that there will be opportunities for everyone. Q: It’s been a while since we had you in an FIA press conference, because last year you were working with Ferrari. Can you tell us a little bit about what you got up to in 2018 and what you learned? DK: Obviously I wanted to race but it was very good to be a part of such a team as Ferrari. It was great to see Sebastian and Kimi working from very close. There was a lot of simulator work; they always kept me busy, it was very nice. Learning, I think it was best that I managed to stay close to the F1 world in a way and tried to do my jobs just as good as possible to help the team to achieve the best result possible. It was a very good experience. Q: Thanks. Pierre, it was a tough weekend for you in Australia, but how much encouragement did you take from Max’s performance? Pierre GASLY: I would say the overall performance during the weekend was good. A good start, looking at the practice, and also the Q1. I think the overall pace was looking promising and yeah, for sure, what happened in qualifying really put us on the back foot for the race and on a track like this made the final result pretty poor and clearly not what we wanted. It was a pretty tough weekend to accept because I think we deserved a better result on Sunday but things didn’t go as we would have liked. We just need to make sure we have a clean weekend. I think the performance from Max is really positive for everybody in the team, and for Honda. I’m really happy for Honda to get their first podium. It’s looking pretty positive for the coming races. Q: It seemed like you got caught out by the track evolution in Q1 in Melbourne, so can we expect a different approach to qualifying this weekend from you and the team? PG: I think we have a better idea of the performance of other teams and on the grid. I think we could see that basically all the teams got a bit closer compared to last year. I think we have a bit more information and we’ll probably be a bit more careful. But let’s see how the performance is from one track to another. It can be quite different. I think Bahrain is back to kind of a normal track and let’s see how the weekend goes. Q: Well, it’s a normal track on which you went very well last year. What chance of a repeat this weekend or going better than fourth? PG: We’ll go for the best we can. We saw in Australia we have a competitive car - in quali and also in the race. For sure Mercedes and Ferrari look really strong but I think the most important thing is that if we manage to put everything together we should have get a good shot at having a good result this weekend. Q: Thank you. Charles, we’re getting used to seeing you in red but it was just your first race for Ferrari two weeks ago. How do you reflect on that and can you just talk about the emotions you felt back in Melbourne? Charles LECLERC: To be completely honest, the emotions, I didn’t really feel them. Obviously when you are at a race you are focusing on the job you have to do in the car and that’s what I try to do as much as possible. It was not an easy weekend. Obviously after the Barcelona weekend we expected more, but on the other hand there were a lot of positives to take. Anyway, Melbourne is not such a representative track on car performance – even though that doesn’t mean we are as strong as we want to be. But yeah, there is a lot of work to do and I’m pretty confident in the team that we have done the right job in between Melbourne and here to try to improve. And on my side I think I did quite a lot of mistakes in qualifying and during the race and I will try to not repeat these mistakes. Q: They weren’t totally obvious to us watching, those mistakes. Can you elaborate? CL: In Q3 I didn’t put the lap in as I wanted to and then in the race I think you have seen the off on the TV. It didn’t have any consequences for the result because obviously I was fifth and there was nobody behind but in other situations it could have been a lot worse, so I need to work on this. Q: Now you finished a minute back on the man who is on your left up on the podium. Was it a particular issue with the car in Melbourne? How did it feel? Did it feel well balanced or did you think it was just track specific and you expect to be more competitive this weekend? CL: We expect to be more competitive. I think our package is strong. We have some answers to the lack of performance in Melbourne. I don’t think we have all of them but we definitely have some answers to it. Then we will only see here whether it was only track specific or if there is something else but I am pretty confident in the package we have. Q: Valtteri, you’re the championship leader for the first time in your career, how does that feel? Valtteri BOTTAS: Yeah, for sure it feels good – but it’s only one race of the season, and now the full focus is to this weekend. Q: You said after the race in Melbourne that the car felt amazing. How confident are you of a repeat in Bahrain this weekend? VB: Honestly, it is quite difficult to say. For sure, we were all positively surprised on the performance we had in Melbourne – but, like Charles said, it is a bit of a funny circuit, and I would say here this weekend and China, we’re going to get a much better picture of the real performance at this point of the year. Obviously it was very welcome for us to see that kind of pace and the feeling with the car was a lot better than in winter testing – so obviously the time spent between was very efficient. So, yeah, see how it feels here. Q: You said after the race that it was the best race of your career. Why do you think that was? Is it because this year’s Mercedes suits you better than either of the previous two? VB: It must be the beard! No, honestly, it really felt after the race that it was one of the best, or my best race. Obviously the start of the race was key to getting the lead – but after that, I did no mistakes and everything was very much under control. And when you feel you are performing at your best is a beautiful feeling. I now just need to keep the momentum and feel that again soon. Q: Do you feel more comfortable in this Mercedes than anything else you’ve driven? VB: For sure, every car is always a bit different and in the end you, as a driver, need to be the one that compensates yourself to the car to get the most out of the package but yeah, I would say in testing, in Melbourne, everything started on the right foot. I never felt anything odd with the car. For sure there are things we can still improve, but yeah, I feel comfortable in the car. Q: (Erik Bielderman – l’Equipe) Question to Pierre and Charles, how did you manage to deal with frustration after the first race. What I mean by frustration is that, for Charles, you couldn’t go to have a proper fight with your team-mate, and to Pierre, that you were expected with the Red Bull to make points and that was not the case. CL: Yeah. There was no frustration on my side. Obviously it is the first race but on the team side I don’t think there was anything to gain, whether I was fourth and Seb fifth, or me fifth and Seb fourth. It was exactly the same amount of points for the team, so it’s understandable that they didn’t want to take the risk for us to fight each other and lose even more points. So yeah, it was like this and I understand the decision. PG: Yeah, as I say, it was quite tough to end up with that result after the promising free practice. We showed some good pace in FP2 and FP3 and yeah, at the end of the weekend, not to score points with the package we had, for sure was difficult. But we know the reasons and we’ll try to do our best to make sure we have clean weekends – because the package is working well. Q: (Jerome Pugmire – AP) Question for Valtteri. There’s been a lot of talk about how you’re much more determined this year and come back much stronger, much more focussed than you perhaps were last year. That question was posed to Lewis and he says he sees no difference because he always considered you to be competitive and a strong driver – but would you say there definitely has been a change in mindset from you this year, and that Melbourne was a proof of that – or is it too early to say. VB: For sure, if you look at the results, it’s obviously very early in the season. It’s one race – but I can for sure say that something in my mindset has changed for the year. The preparation over the winter and just the way of how I feel and think about things has changed. It’s quite difficult to explain in detail but I feel different to years before. Q: (Heikki Kulta – Turun Sanomat) Valtteri, how would you rank this circuit? Is it in the same group with Russia and Austria in your mind? VB: It’s normally been quite a strong race for me but obviously every year it’s a new race, and you still need to go off quite well. 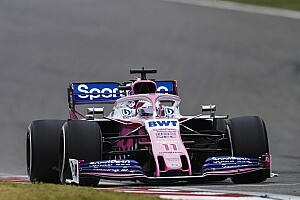 I think racing here, this year, might be a bit better in terms of overtaking with the new DRS zone so I think still, ultimately, the race pace is going to be important but it’s been a strong race for me personally in the past and yeah, I can rate it quite well on my list but obviously the aim is to approach every weekend knowing and aiming to be on top of your game and not to have any bad races anyway. Q: (Kate Walker – New York Times) To Charles and Valtteri: the next Grand Prix weekend in China is going to be our 1000th round of the F1 World Championship. I was wondering if you can tell me, of those 1000 races, whether you were racing or whether you were watching as a fan, what’s your favourite memory? VB: If I have to choose one now, I feel the happiness at home, looking at the TV, of the driver: it was Mika’s first win in 1997 and the last race of the year and obviously he went and won a couple of titles so I would say that was my favourite. CL: My side, I will probably be a bit selfish and maybe Monaco is my best memory because it was my first ever Formula One Grand Prix last year so it was something special and to be completely honest, I haven’t watched that many Grands Prix on TV because I was always out racing in karting so yeah, Monaco last year was my best memory. Q: (Oubay Autosportme.com) My question is to Charles: how could you describe the atmosphere at Ferrari after the first race? And also, is there a fundamental issue with the car or just a matter of finding the perfect balance? CL: I think the mentality is the right one and we need to keep this one throughout the whole year. The mentality is very positive. Obviously we are aware there is a lot of work to do but I’m pretty confident, as I said, in the team, that they will do everything to improve the car. I don’t think there’s any fundamental issues in the car concept. I’m pretty confident in that too. It’s just about fine-tuning. Obviously, as I said before, what we showed in Australia I don’t think was the real performance of the car and I think we are all quite confident that we can be better already from here in Bahrain but as I said, the mentality is very good in the team and we need to keep this spirit. We are all working as a team and all working together and this is a good thing to see. Q: (Luis Vasconcelos – Formula Press) Valtteri already mentioned that overtaking is probably fairly easy this weekend. There are three DRS zones. Is that going to affect the strategy you’re going to have for the race and is this the way you want racing to go with more DRS zones? LN: I think it will affect us slightly. You obviously have more chances of overtaking so you would say a two-stop strategy could be a better chance than trying to do that in Australia, say. I think and hopefully it will cause teams to chose more different strategies, basically, which can hopefully lead to more overtaking, more action, which is always a nice thing for a driver. It’s hard to say. I didn’t drive last year so I don’t know much better or worse this aero package is compared to last year. Some people have said it’s better, some people have said it’s the same or worse – not worse but the same as previous years. I think we have to have overtaking and I think Bahrain, as a track, is definitely better than Australia to overtake anyway, even without DRS zones. But I think nowadays it’s so difficult to overtake in general. DRS is one of the few ways to be able to lead to action and overtaking so I think you’re going to have to have it. Three DRS zones is quite a bit so I’m sure you’re going to see a lot of overtaking and action this weekend. It’s not the most natural and the best way to do it but it’s probably what we’ve got to do, I guess. CL: Yeah, well you can afford to drop back in the standings for an extra stop and have the chance to overtake after again easier. Already in the past I think it was quite an easy track to overtake on with two DRS zones, so with one more it can only be easier. So yeah, it will change the strategy a little bit. That’s it. VB: Nothing to add really. I think that’s it. It’s going to be a bit easier. PG: I think they’ve summed it pretty well. Probably you can go with a more aggressive strategy with that extra DRS zone if it’s easier to overtake but I think the more action it can give us the better it is. 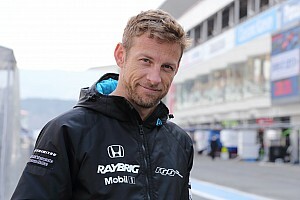 After all there are other ways to overtake; without DRS would be nice as well if we are able to follow each other and there is more action thanks to that and that will be the best way but I think immediately that’s the only thing we can change, the DRS zones, so if it brings some more show, I think everybody’s going to be happier. DK: I think there is always good racing in Bahrain so we just wait and see for the race. Q: (Masahiro Owari – Formula Owari) Question to Pierre and Daniil: you had a problem at the start at Melbourne, you couldn’t see the starting lights. Could you please explain more details; which signal did you see or did you request anything from the FIA? PG: Basically it was a pretty messy start because maybe it was my position but I think also Russell behind me had the same problem and Kubica as well but basically the lights were right behind Daniil’s rear wing so I couldn’t see the red lights. On the formation lap, they pulled the car back so I could see them and then as I got in my position for the race start, basically I was looking for them and also the lights on the side are really forward on the grid. Basically I had no idea so I just started to release the clutch when I saw the others moving but actually it wasn’t ideal and I think they are planning to raise the starting lights a bit because I think it’s probably going to be an issue on other tracks as well. DK: I could see everything so maybe he should try to look up. PG: Maybe because you’re taller. I think it’s better (not) to start in this position any more and that will be the easiest thing. Q: (Abdulrahman Al-Saud – University College Bahrain) Valtteri, what advice would you give to an aspiring F1 driver? VB: Never give up. It’s obviously not one of the easiest sports to get into but it’s possible. As a kid, obviously there were many people who say when your goal is to get into Formula One and be successful in Formula One, they tell you that it’s impossible but seeing the possibility in things, that can be their strength. Obviously there’s many factors to being a driver but you never know. I guess the main thing as a kid, when you’re doing it, is to enjoy it and then normally the rest will sort itself out one way or another. Q: Could we just open this question to Lando as well? You’re a rookie. Anything you can add? LN: I would agree with what Valtteri says, to be honest. It’s obviously a long journey, it’s not quick. You can’t just change from… and I’m sure very few can change from one sport to another but I think a lot of hard work and dedication is what I think all drivers here and all drivers on the grid have put into racing but a similar comment in terms of never giving up, because sometimes it can seem quite far out of reach and then all of a sudden you can be in Formula One, you can have a contract with a team. Similar comments: determination, hard work and not giving up. Many other people have done it, although it’s a very tough sport to get into. There’s only twenty in the world who can do it. I think never giving up is probably one of the best ways to describe it.